County Clare Arts School Noted for Its Educational Classes in Drawing and Painting. Want to learn how to draw? Paint watercolours? If so, think seriously about taking a weekend course at a very special art school in County Clare, run by Julie Douglas and her husband Mark. Why is it so special? Because Julie is a wonderful teacher. At least that's what her pupils say, including a very non-artistic journalist who signed up to see what all the fuss was about. Students fondly describe Julie as the "ultimate motivator", a quality which is reflected in the whole structure of the school, from the intimate size of the classes, to the tasks she sets, and the perceptive, positive encouragement she gives to each student, old or young. In addition to weekend courses, Julie runs part-time termly classes, as well as private tuition, all in a variety of disciplines, including drawing, watercolours, pastels, colouring pencils and charcoal, to name but a few of the media used. The school caters for everyone, from absolute beginners and adult improvers, to groups of secondary-school students preparing a portfolio for art college. A teacher for over 15 years, Julie emphasises that no one feels intimidated in her class. Instead, she says: "you'll be amazed at how good your work is by the end of the day." All the classes are drawing-based because, as Julie says: "the ability to look, observe, understand and reproduce what you see is the first and most important step towards producing a good picture. Painting without learning to draw is like trying to run before you can walk." As a result, she takes a traditional approach, teaching you how to observe, and how to think for yourself. It involves gentle, persistent instruction and encouragement, no gimmicks, no 'quick fixes' - the real thing. It's a modern version of the approach taken by the great Old Masters like Leonardo Da Vinci and Michelangelo, who spent years learning how to draw before they ever took up a paint brush. That's why Julie says, "it is worth putting your paints away for a little while and getting down to basics. This applies to both the complete beginner and the more experienced painter." Students Preparing for Art College. see: Visual Arts in Ireland. Art Jamming and Art Party. There are three standard types of course to choose from. Each class is very small, generally between 7-10 students. Generally on drawing and watercolours. Ideal for anyone local who wants the discipline of regular instruction. Generally on a specific area, such as drawing, portraiture, Life Drawing, watercolour painting (eg. landscape, flower painting, outdoor work). More intensive classes covering the full range of subjects (eg. a day each of drawing, life drawing, portraiture, and watercolour painting). Please Note: Subject to demand, the content of these courses can be extended or amended to include a particular topic of your choice. In addition, Julie offers private tuition for individuals and couples. 3-D arts, see: Irish Sculpture. One of the most interesting courses on offer is Julie's Portfolio Course for students intending to go to art college. Designed to bridge the gap between school and college, this is a fully supervised, intense course which aims to improve the students' attitude, understanding and work ethic for ever, and improve their drawing beyond recognition. As well as receiving individual instruction and personal encouragement, each student has an individual tutorial towards the end of the course, to assess progress achieved and to ensure they know exactly where they are going next. The agenda of the Portfolio Course has been designed in collaboration with the National College of Art & Design (NCAD), Limerick Institute of Technology (LIT), and Cork Institute of Technology (CIT) to remove student uncertainty about what is required in their portfolio. As well as teaching adults, Art in the Park also offers classes for kids (6-14 years). Each class includes a drawing session of some kind with Julie, involving pencils, charcoal, pastel, or watercolours etc. Pupils draw from a still-life subject, or a portrait or a landscape. Afterwards they do some 3-D work involving areas such as paper-making, book-binding, mask-making, or clay modelling. Based on her experience of teaching art in Italy, Julie offers several options for painting holidays in Europe, in a variety of beautiful settings. (See her website for more details). 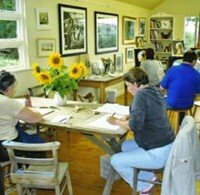 Art at the Park also offer a wealth of other courses with selected visiting tutors including papier-maché workshops, basket weaving, photography, oil painting and more. Born in Co. Down, Julie studied fine drawing and painting at Liverpool and Norwich Schools of Art. Afterwards, she built a successful career in London as an illustrator with top advertising agencies and design groups, working with major companies like. Barclays Bank, Tesco, Pilkington Glass, Paul MacCartney's World Tour programme, and Britannia Insurance. In addition, she illustrated books for several major book publishers like Penguin, MacMillan, Mitchell Beazley. The winner of the Association of Illustrators Award on two occasions, her creative work on an American Express brochure gained a New York Advertising award. She shows her work in galleries in London, Dublin and Galway. Julie's main love is figure painting/drawing, and she receives regular portrait commissions. The main reason she began teaching was because so many people approached her for advice.  For more about culture in Ireland, see: Homepage.  For more about the origins and evolution of visual art in Ireland, see: History of Irish Art.